January 4th, 2007 by Remo Savisaar | Filed under Uncategorized . Kitsed ronivad puu otsa argani pähkleid sööma, mida marokolased kasutavad õli tegemiseks. 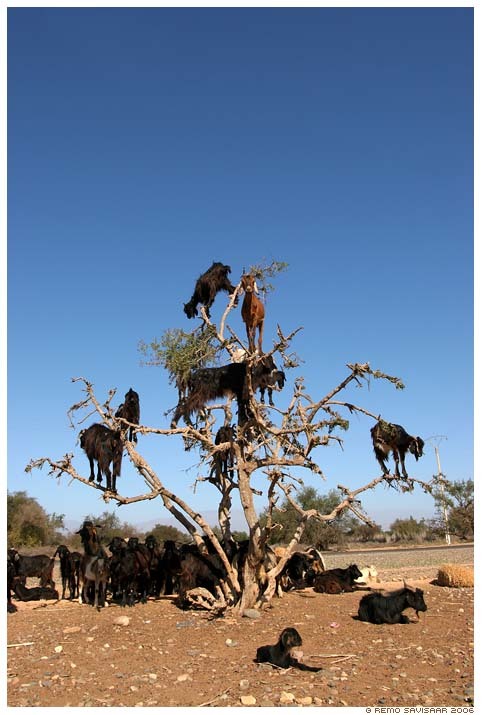 These goats climb the tree to get at the argo nuts used by moroccans to make oil. PS This photo is real, like it was. Nothing added. Oh Joy! I remember Brian Johnson, Henry Blowfeld and maybe Trevor Bailey talking about Goats Up Trees in a rain break on test match special many years ago. And here they are. Ace. did anyone think that they learned to climb trees to get to a source of food. All of them are on branches with small amounts of vegetation attached. Hello! ;) wow… what crazy news! what do U suppose about it? It’s real enough. Check out the shadows on the second picture. Wonderful picture of the herd. I love the goats in every branch of the tree. Saw goats in trees in Morocco, too! that’s so cool! they look like monkeys! There are even better climber-goats out there – http://www.youtube.com/watch?v=F16iJowHLSA&eurl=http://blogs.mail.ru/mail/ya-zmey/friends – why should these simple guys be fake? Tulin just Marokost ja Sinu kitsed puu otsas pilt oli ühes poes, kus valmistatakse kreeme. Ohoh, väga huvitav! :) Mis kujul ta seal oli ja kui suurelt? Arvatavasti siit välja prinditud pilt, mille kvaliteet selle tõttu vajaka jääb. Samas on seda pilti omajagu ka suures formaadis valmispildina tellitud, kuid Markokosse pole veel ükski tellimus läinud. I would like to purchase a download of this picture to put on a year-end card I give to the employees each year with their bonus. It would go with the theme of Thanking each of them for hanging tough with us throughout the year. Hi! 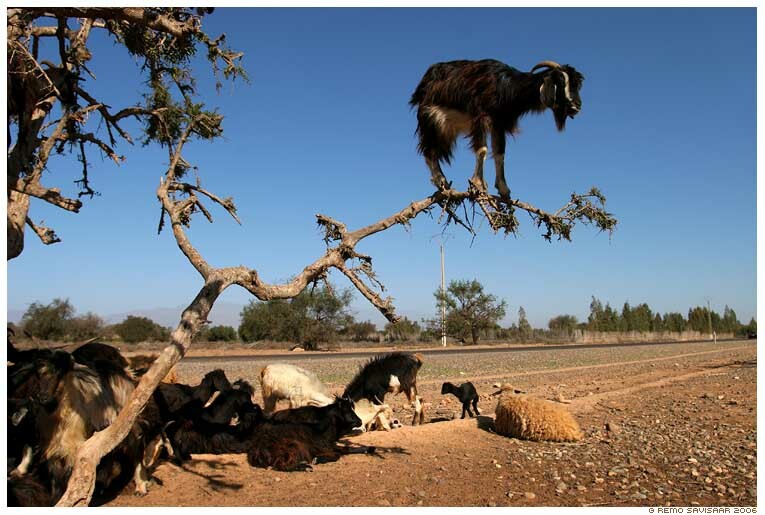 I’m looking for pictures of Moroccan tree goats to be printed in a nutritional newsletter with an article about argan butter. I found your photos through a google search. Please email me at your earliest convenience. Beautiful pics!